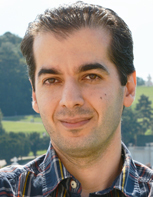 Soheil is a Research assistant and a PhD candidate of the Adaptive Distributed Systems (ADSys) program. He currently works at the Distributed Systems Group, Institute of Information Systems, Vienna University of Technology. Interested in doing your master thesis, write to me. Soheil Qanbari, Fei Li, and Schahram Dustdar. Toward Portable Cloud Manufacturing Services, Internet Computing, IEEE, vol. 18, no. 6, pp.NN-NN, 2014. Soheil Qanbari, Schahram Dustdar and Tian-Shyr Dai, Cloud Asset Pricing Tree (CAPT): Elastic Economic Model for Cloud Service Providers, TCC SI 2014: IEEE Transactions on Cloud Computing, Special Issue on Economics and Market Mechanisms for Cloud Computing. In review! Fei Li, Michael Voegler, Sanjin Sehic, Soheil Qanbari, Stefan Nastic, Hong-Linh Truong, and Schahram Dustdar, Web-Scale Service Delivery for Smart Cities, Internet Computing, IEEE, vol. 17, no. 4, pp.78-83, 2013. Soheil Qanbari, Samira Mahdizadeh, Negar Behinaein, Rabee Rahimzadeh and Schahram Dustdar, Diameter of Things (DoT): A Protocol for Real-time Telemetry of IoT Applications, Internet Engineering Task Force (IETF). Soheil Qanbari, Samim Pezeshki, Rozita Raisi, Samira Mahdizadeh, Rabee Rahim zadeh, Negar Behinaein, Fada Mahmoudi, Shiva Ayoubzadeh, Parham Fazlali, Keyvan Roshani, Azalia Yaghini, Mozhdeh Amiri, Ashkan Farivarmoheb, Arash Zamani, and Schahram Dustdar, IoT Design Patterns: Computational Constructs to Design, Build and Engineer Edge Applications., 1st International Workshop on Interoperability, Integration, and Interconnection of Internet of Things Systems, (I4T 2016), April 4-8, Berlin, Germany. Soheil Qanbari, Samira Mahdizadeh, Rabee Rahimzadeh, Negar Behinaein, and Schahram Dustdar, Diameter of Things (DoT): A Protocol for Real-time Telemetry of IoT Applications, 12th International Conference on Economics of Grids, Clouds, Systems, and Service (GECON 2015), GECON-Conf, Cluj-Napoca, Romania, 15-17 September. Soheil Qanbari, Ashkan Farivarmoheb, Parham Fazlali, Samira Mahdizadeh and Schahram Dustdar, Telemetry for Elastic Data (TED): Middleware for MapReduce Job Metering and Rating, The 9th IEEE International Conference on Big Data Science and Engineering (BigDataSE) (IEEE BigDataSE 2015), Helsinki, Finland, 20-22 August, 2015. Soheil Qanbari, Negar Behinaein, Rabee Rahimzadeh and Schahram Dustdar, Gatica: Linked Sensed Data Enrichment and Analytics Middleware for IoT Gateways, IEEE International Conference on Future Internet of Things and Cloud (IEEE FiCloud 2015), August 24-26, 2015, Rome, Italy. Soheil Qanbari, Navid Rekabsaz and Schahram Dustdar, Open Government Data as a Service (GoDaaS): Big Data Platform for Mobile App Developers, IEEE International Conference on Open and Big Data (IEEE OBD 2015), August 24-26, 2015, Rome, Italy. Soheil Qanbari, Samira Mahdi Zadeh, Soroush Vedaei and Schahram Dustdar. CloudMan: A Platform for Portable Cloud Manufacturing Services, 2014 IEEE International Conference on BigData (IEEE BigData 2014), 27-30 Oct, 2014, Washington DC, United States. Soheil Qanbari, Vahid Sebtoo, Schahram Dustdar. Cloud Resources-Events-Agents Model: Towards TOSCA-based Applications, Third European Conference on Service-Oriented and Cloud Computing (ESOCC 2014), 2-4 Sept, 2014, Manchester, United Kingdom. Soheil Qanbari, Fei Li, Schahram Dustdar, Tian-Shyr Dai. Cloud Asset Pricing Tree (CAPT): Elastic Economic Model for Cloud Service Providers , 4th International Conference on Cloud Computing and Services Science (CLOSER 2014), 3-5 April, 2014, Barcelona, Spain. Best student paper award! Fei Li, Soheil Qanbari, Michael Voegler and Schahram Dustdar, Constructing green software services: From service models to cloud-based architecture in Green in Software Engineering, (invited) : Springer International Publishing Switzerland, 2014. Fei Li, Michael Voegler, Sanjin Sehic, Soheil Qanbari, Hong-Linh Truong, Stefan Nastic, Schahram Dustdar, IoT PaaS: Intelligente IT-Infrastruktur fuer Smart Cities, in: "smart city - Wiener Know-How aus Wissenschaft und Forschung", Schmid Verlag, Wien, 2012, (invited), ISBN: 978-3-900607-50-0, 191-198.